New at Anime Boston: Maid Cafe! By: Nabil Date: March 3, 2018 12:00 PM ESTMore details to come out as the convention draws closer! 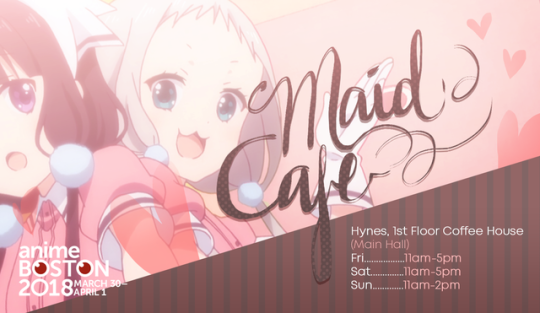 For the first time, Anime Boston is excited to announce the opening of our very own Maid Cafe! Join us for a leisurely experience inspired by the Japanese maid cafes that originated in Akihabara and have become popular in many cities worldwide. Come in for a sweet treat and be greeted by our adorable staff of maids and butlers who will accompany you for your stay. When you are finished with your snack, you can take pictures and play games with us or just sit back and relax. We are delighted to serve the esteemed ladies and gentlemen of Anime Boston!